I was bored and needed some wires with connectors anyway. I would solder the terminals to the wires if I were using it. I realized that the power goes from the INJ fuse directly to the main relay and is also sent to a spare pin in the FB 01 socket that is unused. I removed a connector pin from the connector (you would use your parts car), cut it, spliced into it and plugged it into the L position on the FB 01 connector. This feeds the power to the ECU... If there's still no continuity between the pin and the ECU then you could splice into the W/G wire in the FB 03 connector as well or instead of. The R9 pin and wire go to the L position of the FB 01 connector then to a 30 amp fuse, then directly to the battery positive. You could use short wires and have it quite neat under the fusebox cover. If you don't have B+ on the white wire with a green stripe then you could feed B+ differently to that wire to send it into the wire going into two pins on the ECU. That may allow the ECU to turn on the main relay. You could then pull your INJ fuse and plug the R9 terminal and the wire going to the W/G wire into the INJ socket (with a fuse). I don't want to see you sell your car. You may very well be able to get it running with little money and only a few hours of effort. Last edited by pcb; 09-30-2018 at 07:58 PM. Holy cow, pcb you are a wizard. I did yard work, grocery shopping, parenting, and had a stiff drink instead of working on the car yesterday afternoon and evening. It did my attitude a world of good and I'm ready to dive into it again tonight. 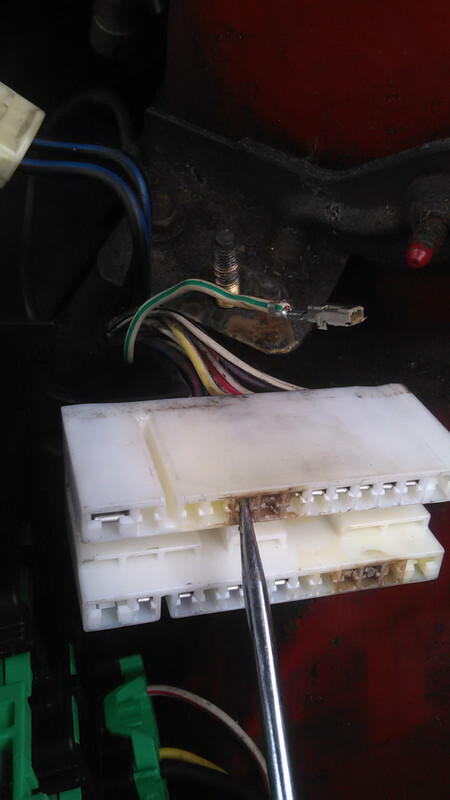 I went to the car and removed the fuse block, the connectors, and the white wire with a green stripe from the connector just to see how difficult it was. I think you should start with probing the white/green wire at the back of the connector to check for B+ with everything connected. I'm almost positive there should be B+ on that wire all the time,.. key in or out. I've reconsidered trying to feed B+ into the connector backwards to hopefully get power to the main relay because that wire and it's connections are meant for low power not the 30 amps that might need to travel through the main relay. Taking power for the main relay from the INJ socket makes more sense. You did say that you got the fuel pump relay going so that should mean the wires and connections from the fuel pump relay to the fuel pump are good. I don't understand why your replacement fuse block isn't working because the power should go from the INJ fuse to the main relay internally within the fuse block but like you said, the wires come and go into lala land. No voltage reading at green white wire. Wiring harness looks intact externally. It looks insane to pull out even on my engine-less parts car. If you remove the white/green wire from the connector, you can put it back in if the bypass doesn't work. You could feed B+ to the metal clip, as well as B+ to to the R9 terminal of the main relay, all with temporary connections and see if it works. Replacing the harness sounds like a real chore. The wires get old, stiff and brittle and can break internally without being visible. A really easy test would be to just simply feed B+ straight from the battery to the backside of the connector with a length of wire and stuff it into the white/green wire terminal to see if the main relay kicks in. It's a white wire with a green stripe. Zero at green white wire again. Note that I tested all the terminals in the long white connector, some had stray voltage and one had 3.15 volts. Then I plugged it back in. 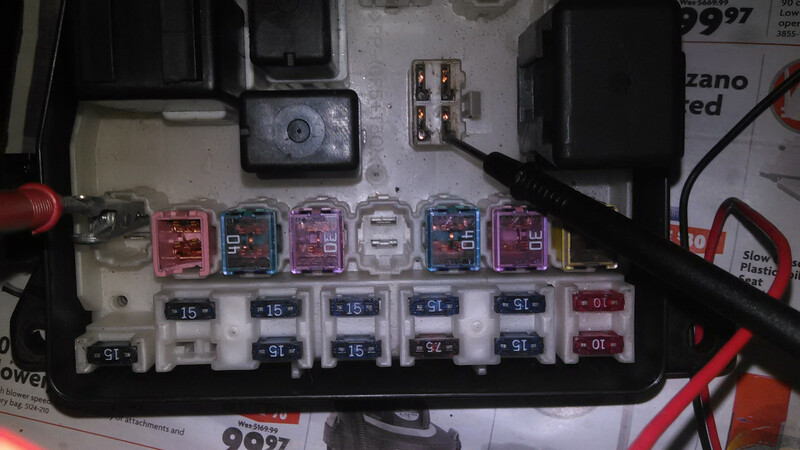 INJ fuse terminals getting clean 12v. Zero at green main relay signal side. Zero at fuel pump relay signal side, of course. I then put the parts car fusebox back in because it's got less scorching on fuel pump relay terminal, and shut down operations for the night. I don't have a sufficient array of spark-wizard clippy wires to perform this magic trick. I will set about acquiring them. Agreed. But that's probably where the broken wire is that fuch'ed this car. Even if temporary bypass connections send power to fuel pump and starts the car, I can't drive it like that - the repairs need to be made. I'm going to have to slit open the parts car's harnesse and find where the wires go from the INJ fuse on that chart and from the green white wire. Then dig into Blue Lemon's harness. F.M.L. I removed my fuse block from my parts car. I have continuity between the left side of the INJ fuse socket and my R9 terminal in my main relay. That connection is internal, inside the fuse block. Check to see if you have continuity. I have continuity between the right side of the INJ socket and the main fuse. I also soldered up another jumper wire. It's not to hard to do. I don't know if you can buy them ?? I've always made my own. Jumper inserted as an example. That's the Output Circuit side of the relay, IIRC. It shows 12v all the time. The Input Circuit side of the main - R7/R8 - shows 0.9 volts with the ignition on (I mis-spoke when I posted"zero" above). I can make all my relays click with the two alligator clips I have and a 12v battery to hit the input circuit and activate it. But these relays don't click when inserted into either fusebox. Is 0.9v supposed to be enough to activate the relay? Where does the R7 or R8 get power from, and how much power should it get? R9 is the 12 V coming into the relay waiting to be switched. If you've got 12 V getting to that terminal, then power is getting through the INJ fuse and making it to the relay. R7 and R8 are controlled by the ECU which I'm pretty sure won't be turned on until the ECU sees B+ on the white wire with a green stripe. That 0.9 V is either erroneous or possibly a bad connection but in my experience a bad connection is all or nothing. If you've got power going from your battery, through your INJ fuse to the main relay (on the R9 terminal) then that's good... You don't have to rewire your relay. But,.. The power going from the INJ fuse is supposed to go from the fuse block, out the Emission harness and into the ECU on pins 4 and 55 all the time. If B+ isn't getting to those terminals, I'm almost positive that R7 and R8 won't be activated. Last edited by pcb; 10-02-2018 at 11:24 PM.